I have too many guys I need to cover today for the usual preamble, at least two of whom were added by request. If you missed the first edition of Serie A analysis, you can find it here. For the most part, this series has focused on players whose stats suggest they are future superstars, and who might be available for transfers. 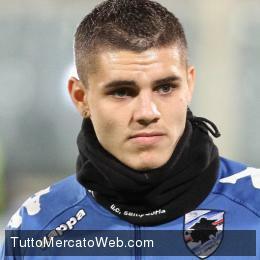 Mauro Icardi just transferred to Inter Milan, but a reader asked me to take a look at him, and who am I to deny that? When I looked at the stats initially, Icardi was on the bubble as a player the model might be interested in. Only 10 goals isn’t an amazing return from an entire season, but that NPG rate is exceptional for a 20-year-old. I’m also impressed by his Shots on Target stats. Sampdoria weren’t very good last season, but Icardi made the best of the service he got. Solid at 20, how good will Icardi be in 5 years? The issue I have with Icardi is that unlike guys like Ljajic, or El Shaarawy, or the next guy on our list, he doesn’t add a whole lot aside from scoring right now. His link-up play is likely fine, but he’s not the pass-and-move young forward that those other guys are. Or at least he hasn’t been when he’s played for Sampdoria. This is a systemic issue that arises when trying to evaluate young players. If they exist in teams that aren’t very good, or ones that play with fairly regressive tactics (think Stoke/West Ham etc), their stats aren’t going to look as good as someone who plays in a slick passing system like Fiorentina. On the other hand, some players have skills that overcome their systems and still make them stand out. Is Icardi one of those? I don’t know, but he should get plenty of chances to show it in the next couple of seasons at the San Siro. Likely price: 12M euros. I think this is a fair price for these stats in a 20-year-old. I assume Inter probably saw more in him than just the stats, and if they did, that price is actually pretty good. I stated this when I did the Manchester City shopping piece for BitterandBlue.com, but I think Lamela is the best young forward in Europe. Primarily a left-footer, he played inverted this season for Roma and was hugely productive out there on the right. Key passes, dribbles, strong LOP stats (Loss of Possession), passing percentage, and even Shots on Target… every damned thing you can think of is outstanding. And then there’s the goal rate, which matches up well with the very best in Europe already, at age 21. You can argue that other players perhaps have higher upside (Ljajic is one), or represent better physical builds for certain teams (Lukaku and Mou’s Chelsea should be a match made in heaven), but nobody has as many peaks in as many places as El Coco. My only issue is that what I said above was perhaps a little generous – he’s not primarily left-footed, he’s almost exclusively so. And yet he completes three successful dribbles a game, which suggests there’s either more going on there, or that left is Robben-esque in potency. If I were a Champions’ League team looking for a young attacking star to put in my lineup for the next decade, this is the guy I would choose. He is that good now and likely to get even better. Roma’s attacking players were fairly ridiculous this season, and made more so by Zeman’s relentless attacking philosophy. I acknowledge there may be some stat skew because of that, but it isn’t enough to take the shine off Lamela or this guy. That stat line looks good as it is, right? Well when adjusted on a Per90 basis, Pjanic’s Key Pass figure goes to 3. And he’s doing it mostly while playing central midfield. *Whistles* That is impressive. His passing stats are also outstanding. While Roma don’t exactly play many long balls as part of their scheme, Pjanic completed long passes at a 78% clip. He’s still only 23, and doesn’t enter his prime for another couple of seasons. As a midfielder, you would definitely want Pjanic to improve his defensive stats. He averages about 2 tackles and .5 Int a game adjusted for Per90. However, if you are comfortable with that type of midfield contribution, and instead need a provider who can play through balls from deep, ping longer passes over pressing defences, and who can also dribble and take set pieces, Pjanic is your man. 18 goals in 20 starts in Serie B is pretty amazing, and only slightly less so when you consider it was done for Zeman when he managed Pescara. Insigne stepped up to play with the big boys last season and this is what happened. There are a ton of shots being taken on the left side here, which is what you expect from a wide forward, right? 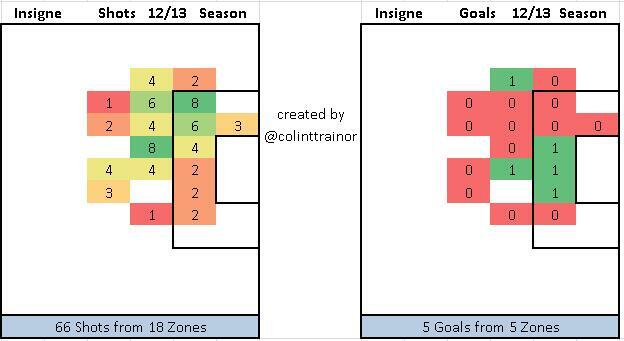 Except a) not nearly enough of these are on target (as shown by his low SoT%) and b) all the goals come from central areas. Maybe Insigne needs a more central role to get goals? Or maybe his outside shooting needs to be dramatically reined in. At this point I’m just babbling, but it feels like there are adjustments that can be made that would improve his production. Cavani is almost certainly off to one of Europe’s giant clubs, but if Insigne finds his goalscoring feet, I get the feeling Napoli will be just fine when he’s gone. Likely price: Not for sale. According to a number of media that I follow, Ilicic is off to Leverkusen, presumably as a replacement for the departed Schurrle, while Leverkusen also keep a hefty profit in their pocket as well. The reporters don’t seem to rate him very well, but as I noted on Twitter, his stats are actually pretty good. It bears noting that he played for Palermo this season, who were dreadful and got relegated. As a point of fact, he’s been at Palermo since he moved in 2010. The first season he was there, he put up an 8G/7A season in 30 starts, good stuff for a 23-year-old moving from Slovenia. 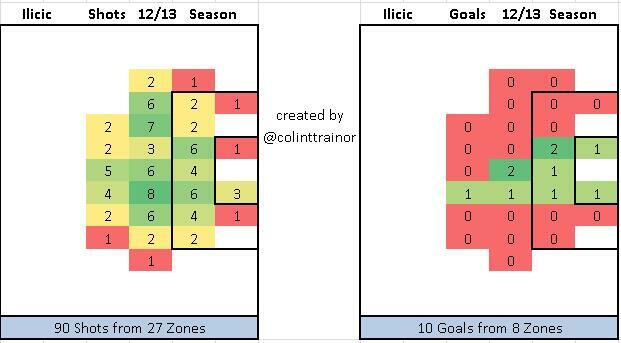 The goal rate here doesn’t crack the .4 threshold, but Ilicic’s key pass numbers are good enough to suggest he will become a better overall offensive performer when surrounded with better players. Instead of being a great big fish in a small pond, he has a skill set that should mesh well with the ongoing Leverkusen revolution. The concern – and this is a fairly big one – is that his Shots on Target percentage is bad. You hope that this is a by-product of playing on a bad team and still trying to produce, but if it’s not, then Ilicic would likely perform better when shooting a bit less and setting up good teammates a bit more. Thankfully, we have the awesome shot heatmaps from Constantinos and Colin again. 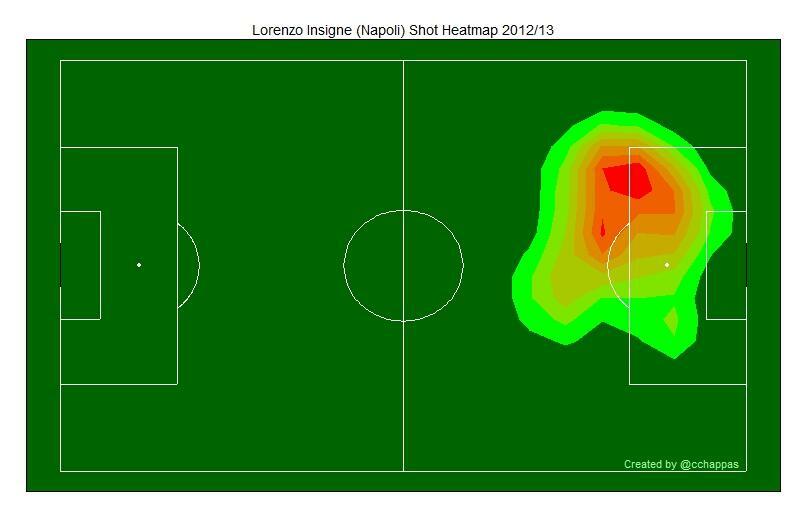 You want to see what a heatmap looks like for a decent player who plays on a really bad team? Look no further. I am not an AC Milan fan. In fact, I actively dislike the club for various reasons, not least of which involves the San Siro pitch and Arsenal ties in the Champions’ League. Yeah sure, they have great, iconic home uniforms. But they also have Kevin Prince-Boateng. And Robinho. And Silvio Berlusconi. Bleh. I mention all of this because I really want to dislike Stephan el Shaarawy as yet another spiky-haired annoying element of Milan’s descent from megateam into looney bin. But I can’t, because oh em gee, is he good. He’s 20. Take everything I said above about Lamela except (maybe) the dribbling, and apply it to El Shaarawy. Now I’m waffling – maybe this guy is the best young forward in Europe. In motion he looks like this. Likely price: £35M and probably worth every penny. Napoli had Cavani, Insigne, and Hamsik this past season. That is certainly a forward line that will give defenders bad dreams and sleepless nights the week of the game. Obviously at this point Hamsik is a household name, but it was only a couple of years ago that he was frequently labelled as “precocious” or “talented but inconsistent.” With that in mind, I wanted to take a quick look at exactly how good he is now. His numbers this season were quite good for a forward. Except Hamsik doesn’t really play forward. He plays as attacking midfielder most of the time now. Those numbers from an attacking midfielder – one who doesn’t take penalty kicks – are ridiculous. LOP numbers are really strong, key passes are up over 1 a game this season, dribbles are up, and goal and shots on target are constant year on year. It deserves noting that the shots on target numbers he is putting up are also really strong for a forward, and outstanding for someone who plays even deeper. Hamsik is probably one of the Top 10 guys in the world in his position. He doesn’t get the plaudits that your Matas and your Silvas and your Ozils get, but he doesn’t play for the Spanish or German national teams, and he is every bit as good as they are. And he’s been doing it in Napoli since he was 20 years old. Here are his remarkably consistent five-year-production numbers. Marek been smooth since days of Underoos.